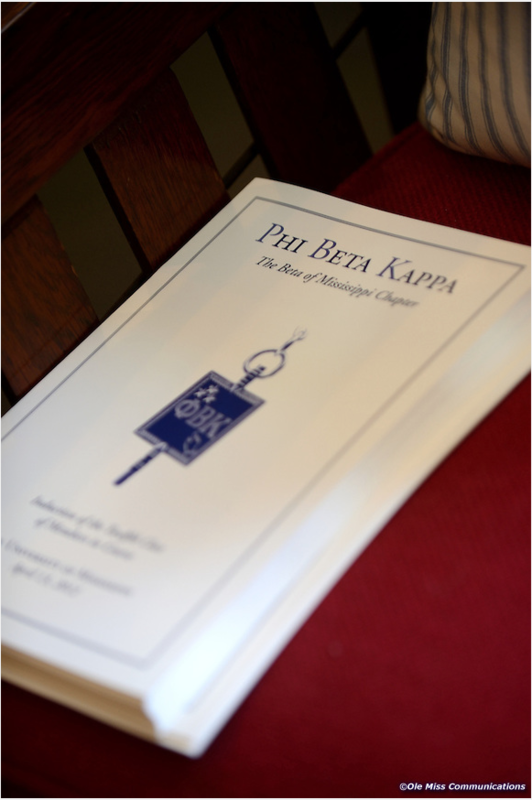 Beta of Mississippi Chapter officers and committees are comprised of resident members. The following is taken from The Phi Beta Kappa Society Manual for Chapter Officers written by the Committee on Chapters. might endanger the life and health of the chapter or the liberal arts character of the institution. In most chapters, the President holds office only for a year or two, as prescribed by the chapter bylaws, and may be a distinguished alumnus not on the teaching staff of the sheltering institution. Some chpaters have a Vice President chosen from the faculty members of the chapter one year and from the alumni members the next, each of whom in turn succeeds to the presidency. This alternation works well and has its advantages. The Vice President performs all the duties of the President in the event of the President’s absence. In some chapters it is the Vice President who coordinates the details of the Visiting Scholar Program. serving as the institutional and chapter memory on prior actions and programs by keeping accurate records, publications, and materials at hand. For most chapters (those that elect fewer than fifty members a year) these rather technical activities of the Secretary do not make heavy demands on time, but they require experience and accuracy, and they cannot be easily delegated. The Secretary needs the services of an assistant who can handle mailings and other non-confidential items, a computer with e-mail capability, and photocopy and fax machines. For the roughly forty chapters that elect more than 100 members each year, the chapter may need to arrange formal aid for secretarial assistance from the university’s administration. In areas where Phi Beta Kappa associations exist, members of these groups may be willing to help with secretarial chores (e.g., writing notices of election and invitations to initiations). arranges for an annual audit of the chapter’s books. In small chapters this office is often combined with that of Secretary. gives a brief history of the Society and of the local chapter to the initiates during the induction ceremony. Arrangements should be made with the sheltering institution for the safe storage (in the library vaults or in facilities set aside for the chapter’s use) of the chapter archives, including the charter. Care should be taken to see that important correspondence, meeting programs, printed poems, addresses, chapter catalogs, and other publications are deposited in the archives. If the chapter does not have a historian, the Secretary or the Vice President usually assumes these responsibilities. The officers, plus one or more elected members of the chapter and, usually, the immediate past President, constitute an Executive Committee; it can handle most of the regular business of the chapter except the election of members and officers and amendments of the bylaws. The Executive Committee has less responsibility in a very small chapter than in a large one and may not even be needed. A committee separate in membership from the Executive Committee should be elected (or appointed) to examine student records and to nominate undergraduate (and graduate) student members. It should be a continuing committee, balanced in membership among the principal divisions of the liberal studies, with one or two members retiring each year. Most chapters are well served by a committee of four to six in addition to the Secretary, who serves ex officio. The Secretary starts the process of electing members in course. He or she should secure the records of students from the registrar’s office at the appropriate time and as early as possible. As the most experienced officer of the chapter, he or she guides the Committee on Members in Course in preparing the list of nominations in accordance with the objectives of the Society and the bylaws and customary practices of the chapter. He or she notifies new members of their election, informs the press, instructs the members-elect, reports elections to the Society’s national office, and orders jewelry and membership certificates. The committee should recommend election only by a substantial majority and should be relatively conservative in the number of its nominations, being guided by the chapter bylaws. The committee should prepare citations or statements of the qualifications of each recommended candidate and present them to the chapter with the nominations.